Town and Regional Planning students and their lecturers are using their skills to make a difference in a local community. During the next few months, this CPUT group will come up with an improved layout of the Flamingo Crescent Informal Settlement, which is located in the Southern Suburbs of Cape Town. This bold initiative is part of a Service-Learning Project that will see the CPUT group work closely with the Informal Settlement Network (ISN) and Community Organisation Resource Centre (CORC). These organisations aim to assist communities within informal settlements to achieve community-owned and driven development processes. Lecturer, Nicholas Pinfold says the partnership aims to ensure a holistic approach that encourages community participation wherever possible. 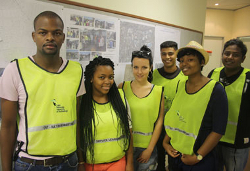 Recently students and lecturers visited the Flamingo Crescent Informal Settlement and met with community members. Student also evaluated the site and developed a timetable for the initial mapping of the settlement. The group will present an improved layout plan of the settlement later this year to the City of Cape Town.